No diesel or hybrid engines come with the Scirocco R. This is a car focussed on performance and it makes no apology for wanting to show people a good time. Two versions are on sale in Australia, with a 6-speed manual starting from $51,236 and a DSG alternative priced from $53,863. Volkswagen already has a successful hatchback series with its Golf. The Scirocco is the company’s take on a car that is a little less responsible in exchange for being a lot more fun. And it’s obvious right away from the exaggerated styling. Wide arches hang over 19-inch wheels to give the car a hunkered stance. It looks phat — of the ‘pretty hot and tempting’ variety — and VW has used several design cues to keep eyes fixed on its low profile. 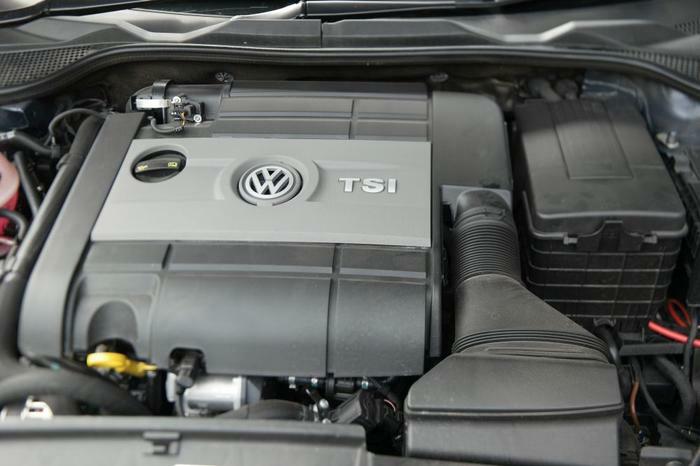 Up front is a widened air intake and inside it are black inserts that run horizontally. These black ‘grillz’ guide eyes left and right to squashed daytime running headlamps. Get the right angle and the matte-chrome mirrors make the car appear even wider. The same can be said of the rear, that rounded and bulbous behind, with its narrow roof, inflamed bumper and gaping exhausts. There’s a whiff of sports coupe about the VW Scirocco and this sense is only reiterated inside the car. Luxuries, including a start button, electric seats an economic stop-start engine, have been swapped out for finishes that are raw. Centred on the dashboard is an instrument binnacle replete with an oil temperature gauge, stopwatch and boost gauge. This is a car for drivers in the vein of Subaru’s BRZ, with a bottle opener built into the cup holders and roll cages doubling as headrests for the rear seats. Some civility has been assimilated well into the Scirocco’s sporty bravado; a point that separates the German hatch from Subaru’s fun coupe. It is well equipped with most features coming stock. Only two optional extras are available, including a panoramic electric glass sunroof ($1750) and the Vienna leather upholstery ($2850) equipped on our review car. Large bucket seats prove comfortable over long cruises and support drivers during tight corners. Even the rear bucket seats make for a pleasant fit, although one that is snug. Taller folks will have a harder time cooped up in the back as the low slung roof cuts into the headroom. Plastic makes up most of the dashboard and its ubiquity is a reminder VW has tried to keep the Scirocco as light as possible. 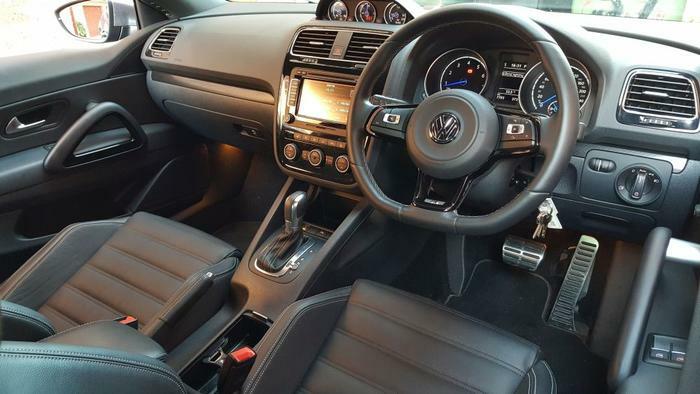 Piano black insets and a rich infotainment system dress the drab material up. Central to the system is a 6.5-inch touchscreen and an 8-speaker sound system. 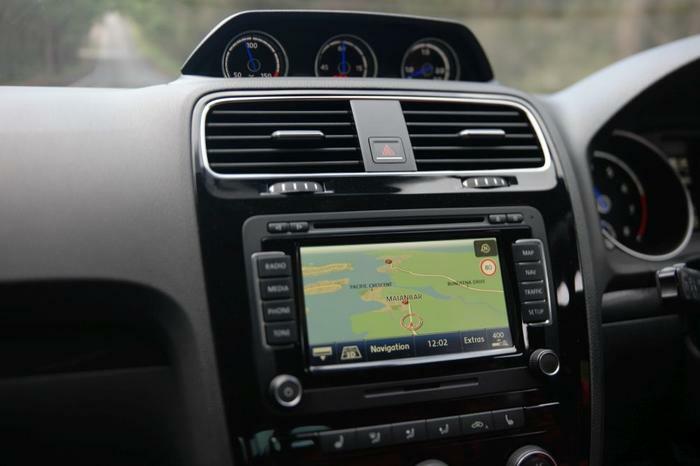 Satellite navigation is featured as standard, there’s a 30GB hard drive that can be used to store multimedia, along with Bluetooth for music streaming or phone calls, and a disk slot for CDs, mp3s and DVDs. Buttons flank the touchscreen to make switching between different sources easier. Having these shortcuts means drivers spend less time finicking about and more time eying the road ahead. Supporting the infotainment system is a trip computer in the instrument cluster. Drivers can manage most media and settings from this screen by using the controls on the steering wheel. Only the most necessary driving aids are equipped. Engage reverse gear and the display alternates to a high resolution rear view camera. It has been mounted low and makes use of crisp graphics in keeping with the Scirocco’s youthful character. Easing the parking process is VW’s optical parking system. Sensors discreetly integrated into the car’s bumpers let drivers know how far obstacles are from its panels. Under the stout hood of the Scirocco is a 2-litre, 4-cylinder engine that has been turbocharged to produce 188 kilowatts. Power is fed to the front wheels with maximum torque experienced from 2400rpm to 5200rpm. Australia has missed out on a more powerful 206kW engine variant on account of the hot climate. That model is reserved for our European cousins, but the 188kW engine never left us wanting. An involving 6-speed manual comes as stock. It helps the Scirocco reach 100 kilometres an hour from a standstill in 6.2 seconds and consume 8.1 litres of fuel for every hundred kilometres travelled. Our review car came with a direct shift gearbox (DSG), which uses a secondary gear set and clutch to streamline gear changes. VW claims it’ll hit the hundred mark in a lesser 6 seconds and is more economical by using 8 litres of fuel for every 100 kilometres. Driving modes determine if the Scirocco will lean towards speed or economy. The default mode prioritises fuel economy by shifting gears early between one- and two-thousand rpms. Couple it with the ‘comfort’ mode of the adaptive chassis control and the car lends itself to city driving, quietly purring come breaks in traffic. Comfort mode will iron out small bumps for a fuss free ride, but larger potholes jab the car and offer a reminder of its low ride height and 19-inch wheels. Shift the stick down one further for the ‘sports’ mode. Here the gears stretch to 6500rpm as the engine turns lively. Rivalling turbo cars, such as the Subaru WRX or the Volvo V40, have a soundtrack where the turbo smothers the natural sound of the engine. Never is there a sense that the power is slowly ramping, building up a thousand revs at a time to a climactic pay-off. They lack the audible thrill of suspense. 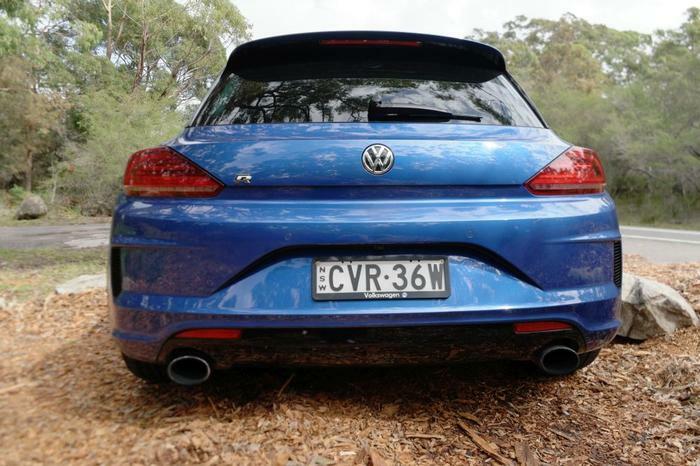 It’s different with the Scirocco R. The German hot hatch has a prominent engine note — no doubt accentuated by its exhausts — even when it’s resting in idle. Drivers at the lights will be able to tell it is lingering at the corner of their periphery. With a hit of the throttle comes a melodious wave, a raspy note from the guts of the car’s engine, that stretches long until the needle taps the redline. The turbo spools in the background with its intensity heightening as the speed builds. The two work in tandem from early revs right up until the redline. Change gears and the engine mutters a ‘puff’ ahead of the second act. The veracity of the gear change has a semblance of an old school manual, particularly because the downshifts double effectively as an engine brake. Pop the car’s chassis control in ‘sports’ and it’ll grip well enough in the corners to forget that it’s front wheel drive. Some electronic wizardry is behind its poise, namely the car’s extended electronic differential lock (XDL). It gingerly applies the brake of the inside front wheel to improve traction, prevent wheel spin and reduce understeer. 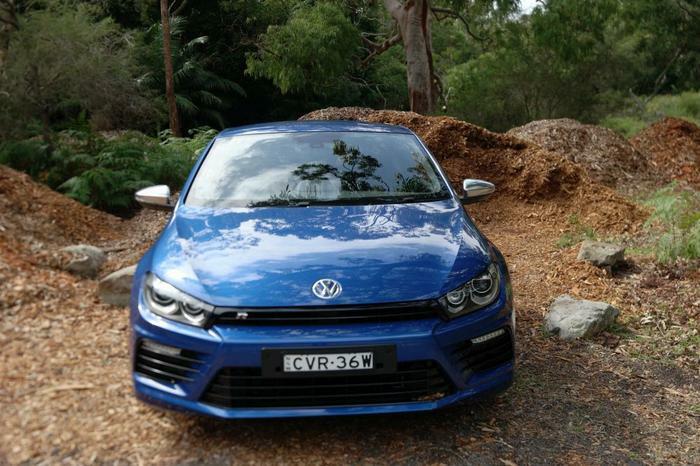 We found it effective as the Scirocco felt agile in the bends. The Scirocco R offers the kind of thrills common to the Subaru BRZ/Toyota 86, with a rev-happy engine and a raspy exhaust note, though it manages to do so with fewer concessions and more luxuries. The front wheel drivetrain might mean this VW is not as fun as its Japanese rivals, but it certainly is more fun to live with.